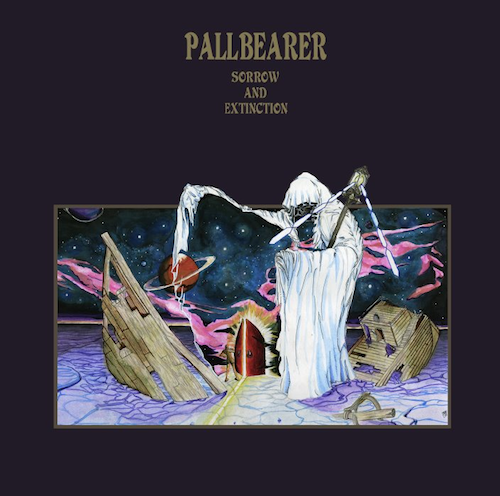 Pallbearer's new record has leaked. I've already ordered my copy but I've listened to it multiple times through their live stream and wow am I impressed. The demo was excellent as was their performance at Rites Of Darkness III (an unexpected highlight of the festival) and this is record goes further — managing to give me goosebumps from the heaviness and despondency layered within. On Sorrow And Extinction (as on the demo) the vocals are a huge draw for me. A Black Sabbath kind of vibe. They're beautiful, strong and gloomy, very passionate and flow perfectly along side the melancholic, huge, thick riffs to create a wonderful harmony. His voice rings through the suffocating darkness adding much to the cold atmosphere — sometimes they drone and at other times they're sung shaking with melodic majesty, but always exude numbing pain; truly stunning. Crashing bass licks compliment this dynamic with a deep growl underneath, and a steady beat lifts all this up artfully. Barely reaching a mid pace except for a few moments Sorrow And Extinction steamrolls over you, and with elegance at that. There's five tracks, two of which are reworked from the demo which sound even better than the originals with a few new additions. The new tracks are so sweet and sad. Foreigner opens with an acoustic melody that soon turns into the fuzzy roar found in the rest of the song, making walls shake with they're sheer might. The vocals on this track are glorious especially near the end. An Offering of Grief pulls you through more lonesome travels at an agonizing pace, a slow crawl of land-splitting riffage and melodic climbs. Near the end coarse yells lead to a brief acoustic interlude only to tumble back into dark territory under a solo. Given To the Grave starts with a low bass lead and choir-like synths, breaking into more full on sad beauty with a clean section soaked in an ethereal atmosphere. This is broken by Brett's sorrowful vocals and crushing, slow grooves and eventually a spacy effect laden solo that plays off the main riff; the tail end is punctuated in this kind of style bringing the album to a close with the heavenly synths fading out. This is truly an epic, deep journey. Pallbearer do not disappoint and inject their doom with a nod to the oldschool while staying fresh effortlessly. Highly recommended. You can hear this magnificent record streaming at NPR right now, and you should pick it up over at Profound Lore Records too. Bloody hell this is amazing. Fully recommended to anyone with a passing interest in doom. Got to see one song during sxsw, it was crushing. Thanks.